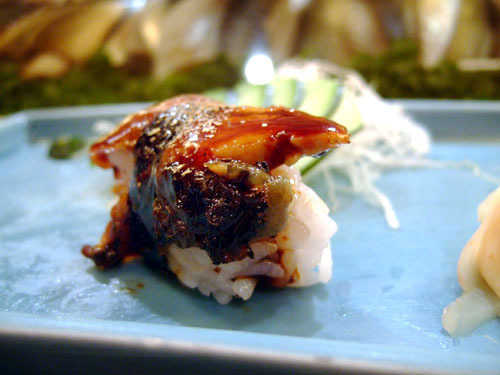 When I heard the name "Shibucho," the first thing I thought of was the somewhat popular and quite well-regarded sushi restaurant in Costa Mesa. Well, after doing a bit of digging, it turns out that that Shibucho and this Shibucho share more than just a name. Shibutani-san, the owner of the current Costa Mesa restaurant, originally opened Shibucho on Beverly in 1976 (one of the few sushi joints open at the time I must imagine). 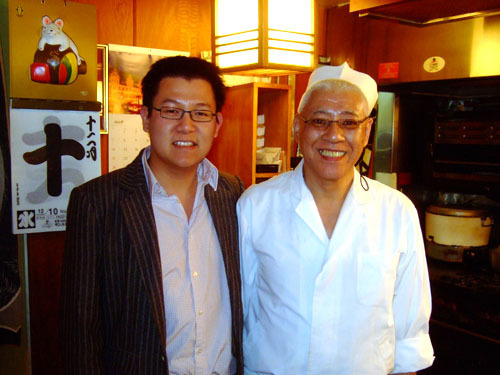 He proceeded to open another location at Yaohan (now Mitsuwa) Plaza in Little Tokyo, and due to the stresses of running two restaurants, sold the original Shibucho to employee Shige Kudo, the current owner and chef of the Beverly restaurant. Shibutani-san then proceeded to sell the Little Tokyo location, and moved back to Japan to train his son, Naga. 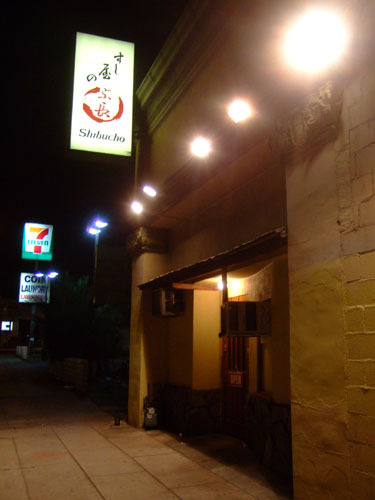 After a while, the duo came back to the States, opening the current Shibucho in Costa Mesa. So that's what happened; now you know. The unassuming entrance actually reminded me of many restaurants in Japan, with modest exteriors that belie the caliber of food within. Shibucho is located along a rather desolate stretch of Beverly, next to a 7-Eleven (convenient if you suddenly feel the urge to indulge in a Slurpee). Street parking should be free and abundant. 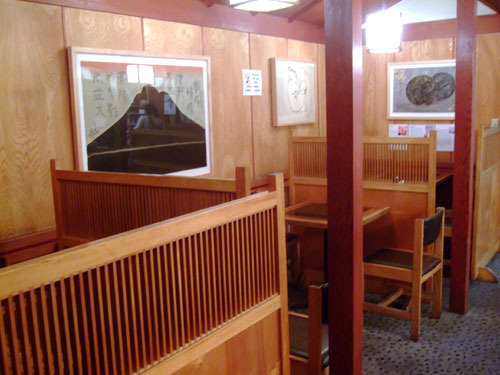 The decor is fairly typical for a sushi restaurant, with lots of light wood, and plenty of lighting. 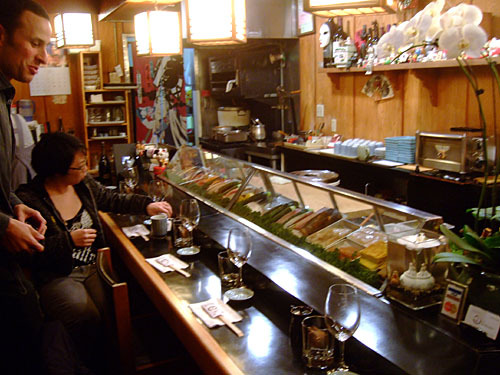 Most of the admittedly small space is taken up by the 10-seater sushi bar, manned solely by Shige-san. Note the shelf full of good luck cat figurines ("they don't work! "), given to Shige-san from customers. On this particular night, we pretty much took over the entire restaurant--the way I like it (though one other lone patron did wander in half way through our meal). There are also a few tables, which were left unoccupied save for the lone customer mentioned above. Note that the floors are stone, which is fairly unique. In the second photo, we see the order of the wines after we let Shige-san arrange them to best complement the food. Naturally, we started with the Champagne (which I'm inclined to start just about any meal with). Note how he put the Beychevelle (the youngest wine, the only one younger than me) last, as it needed some time to breathe; but come to think of it, I think we pretty much decanted every wine. We also had some Asahi beer to start, but I didn't partake much, since I was saving myself for the good stuff! A glass of bubbly is a classy and delicious way to kick off most any dinner, and this was no exception. Now I usually like to go with a younger, lighter Champagne with sushi (see the Cristal and Dom on my last visit to Urasawa, the time before, and time before that), but since tonight's theme was old wine, I decided to go with the 1978 Dom Pérignon. Prior to this, the oldest Champagne I've had was a 1990 Krug, which, coincidentally, was also drunk at a sushi restaurant: Sushi Sasabune. My prior experience with old sparklers told me to expect something heavier, toasty, and yeasty, something slightly akin to an old Bourgogne Blanc. But what I got was something with a sweet, caramel nose not unlike a Sauternes, followed by a light, dry, surprisingly effervescent, minerally attack, leading to a delicately sweet finish. I was actually very pleasantly surprised, and I think the wine went over quite well with everyone else too. Interestingly, as he was pouring, Shige-san mentioned that he thought that now was the perfect time to drink this particular Champagne, so I guess I timed it right! What was really interesting about the ankimo was the color variation. 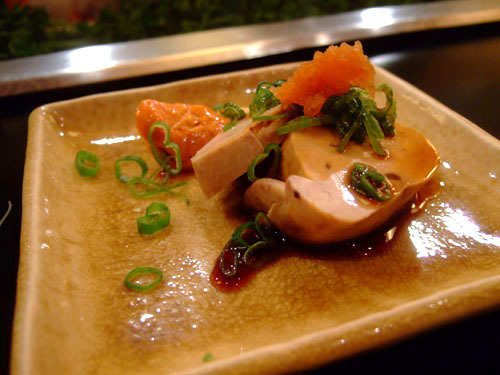 I'm used to the monkfish liver being beige-pink, but what we had here had parts that were markedly orange in hue. We were told by Shige-san jokingly that this was a natural coloration, brought on by "liver cancer." In any case, the redder parts of the ankimo were actually much milder (with the lighter parts brinier), and went better with the Champagne. I quite liked the ankimo on its own, but appreciated the complexities added by accoutrements of momiji oroshi (chili-infused grated daikon), scallion, and ponzu. One of the better preparations of ankimo I've had. 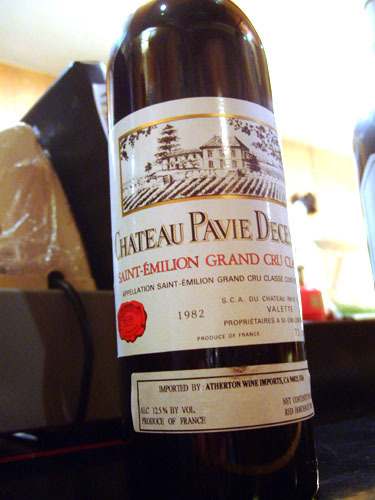 Pavie-Decesse is one of the three "Pavies," with the other two being straight Pavie and Pavie-Macquin (which is controlled separately). 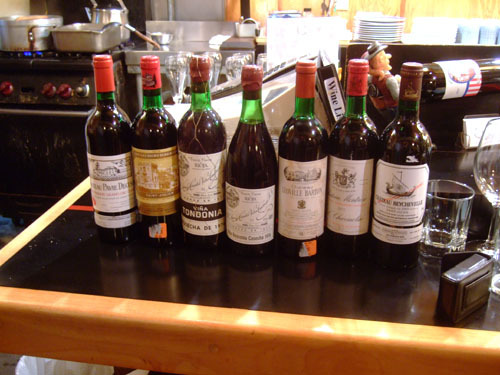 It is "only" a Grand cru classé wine, versus the other two, which are Premiers grands crus classés B. Initially, I found the '82 intensely smoky, with a thick, meaty nose that was difficult to cut through. Fortunately, it got better and better the more I drank, eventually showing a softer, more fruit-forward side. 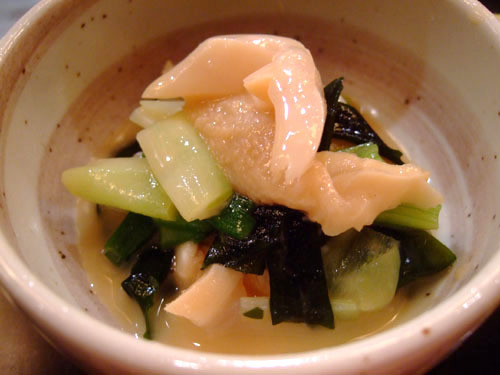 I believe the proper name for this "salad" of geoduck, clam, scallop, and seaweed is sunomono. The shellfish themselves were rather mild, taking on the piquant characteristics of the seaweed and scallion, all over a sweet base of what I believe was miso or vinegar. The Pavie-Decesse actually worked pretty well here, as the subtle sweetness of the dish tempered the fiery nature of the wine. 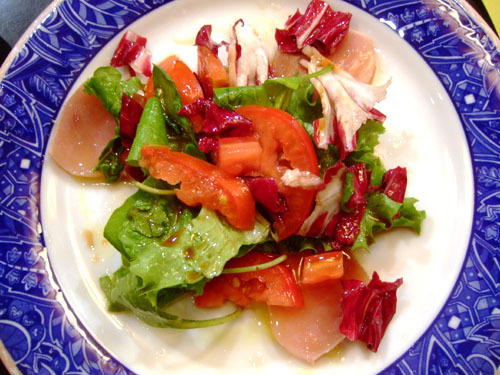 Plenty of ponzu was used here, enough so that the salad really could've stood on its own without the albacore. Not that I didn't appreciate the fish, I rather liked the textural contrast and light fishiness it added to the dish. 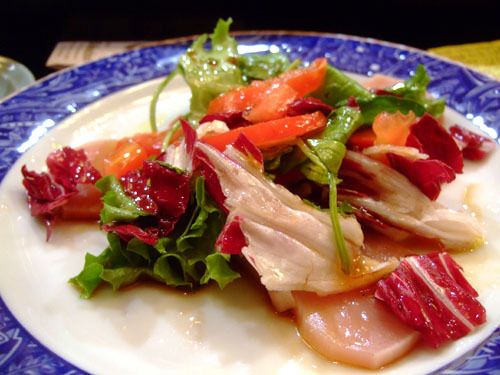 I find that albacore, when served in a sashimi preparation such as this, tends to get drowned out by the accompanying sauces (some have accused Sasabune of this, though I didn't have a problem). Fortunately, that wasn't the case here, as the tang of ponzu successfully drew out the natural flavor of the fish. 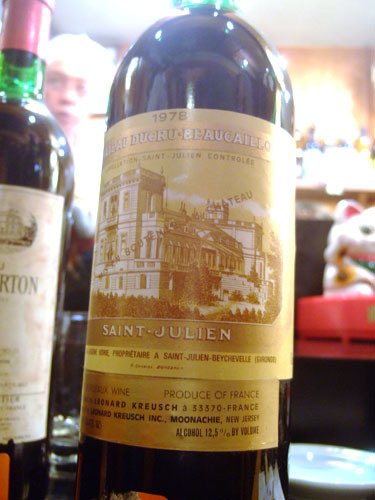 Time for the 1978 Ducru-Beaucaillou. I got a lot of leather on the nose, with very little fruit. On the palate, not much changed, and I noted surprisingly tight tannins along with some bit of spice. It was too lean for me, and I thought it really accentuated the fishiness of the albacore, which was a bit off putting. Will, however, liked the effect. 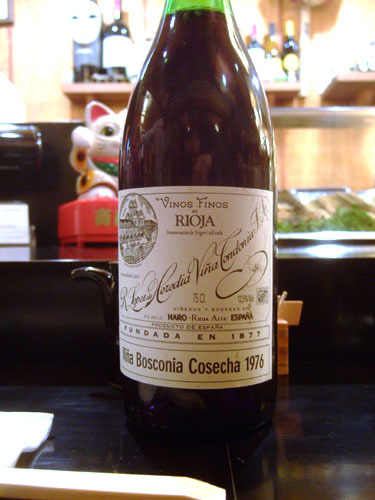 There were two Riojas on tap tonight, both 1976, and both from producer R. López de Heredia Viña Tondonia. The first was the Bosconia, from the winery's second vineyard, El Bosque. Brian compared it to an old Burgundy, and gave us some left over pieces of ankimo to try with it; I must say that the wine did really bring out the flavor of the liver. By itself, the wine was smoky and spicy on the nose, and vegetal on the palate, with just a hint of dark fruit. If I'm not mistaken, I believe we were told by Shige-san that the toro was from Italy; I think this is the first time I've heard of sushi fish coming from there. No matter, the toro was milder and leaner than I would've preferred, definitely more along the lines of a chutoro than otoro. It lacked the unctuousness and overt fattiness that a really great toro possesses, and seemed rather austere. I guess I've been spoiled by the toro I've had at places such as Kyubey, Urasawa, and even Go's Mart; such "regular" toro doesn't cut it anymore. The wine actually went pretty well here, which may be attributable to the gently rich flavor of the fish. According to Will, the tuna here was actually cut from the belly loin of the fish. 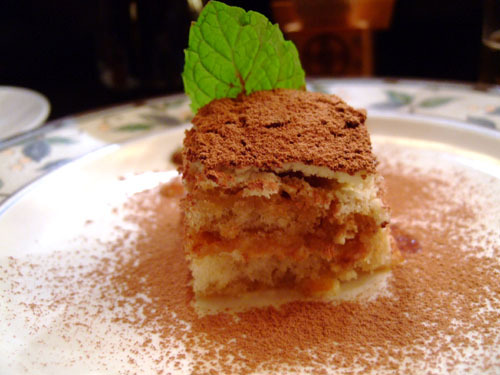 Indeed, it did seem a slight bit creamier and fattier than usual. However, as I've touched upon before, mere tuna seems a bit boring now, compared to the other types of ingredients out there. 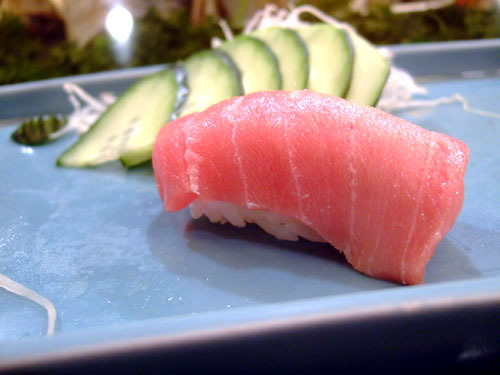 There was nothing wrong with the tuna here; it's a gripe I have with pretty much all maguro. Again, as with the toro, the wine did allow the fish to shine. Perhaps tuna just works with wine? Here we see Shige-san working his knife skills on a filet of buri (and about his knives, I think I've read somewhere that some of them cost near $10k!). 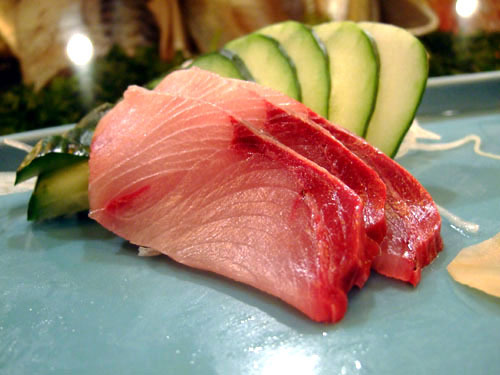 Compared to your typical hamachi, buri is adult yellowtail, and is often wild instead of farmed. 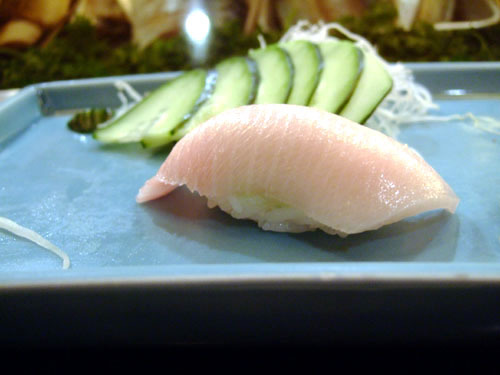 The result is a more complex, more mature flavor compared to hamachi; it's also generally less fatty. Unlike with the tuna, I much preferred the buri sans vin. 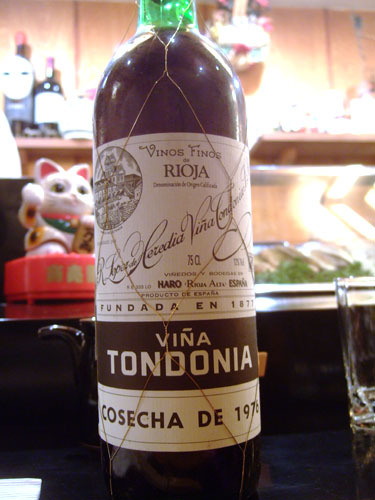 The second Rioja came from Viña Tondonia's flagship Tondonia vineyard. Compared to the first, it was much richer and meatier in aroma, and even had hints of Port. The taste was considerably fuller, with much more fruit, wood, as well as minerals. It was also much lighter in color, and body. I definitely preferred it on its own, but when eaten with the sashimi, the wine tended to really draw out the fish's metallic nature. We were instructed by Shige-san to eat the halibut without soy, though I did sneak a bit of it on my last piece (he was right, it wasn't necessary). The fish was served here with yuzu, and I really appreciated how the refreshing tartness of the citrus accentuated the subtle flavor of the fish. Again, the nature of the hirame made it a fish best served senza vino, as the Léoville I had with it tended to draw out the halibut's fishiness. 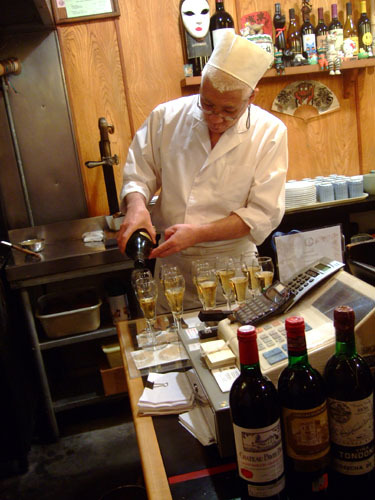 Shige-san is somewhat well-known for serving patrons French and Italian dishes in addition to sushi and sashimi, to go along with red wine. Eggplant parmesan is a common Italian dish that originated in Sicily, though interestingly, it traditionally is made with mozzarella cheese, not Parmigiano-Reggiano. Not surprisingly, this was the first time I've had anything like this at a Japanese restaurant; I'm told that Japanese eggplant was used. The flavors of the cheese were clearly dominant here, and the whole effect was not unlike eating a pizza! Naturally, red wine was a natural pairing here. 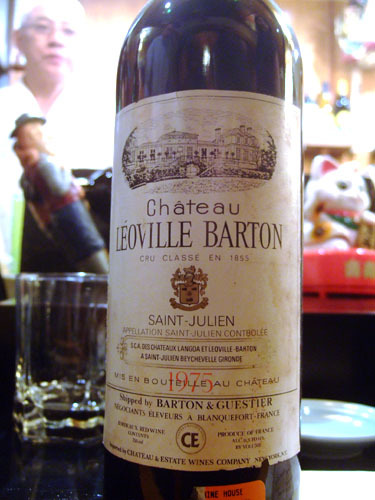 The 1975 Léoville Barton demonstrated very faint notes of dried fruit in an very meaty nose, weak tannins on the palate, and a touch of smoke and cedar. It went superbly with the eggplant dish, which tempered it a bit--but with the halibut...not so much. 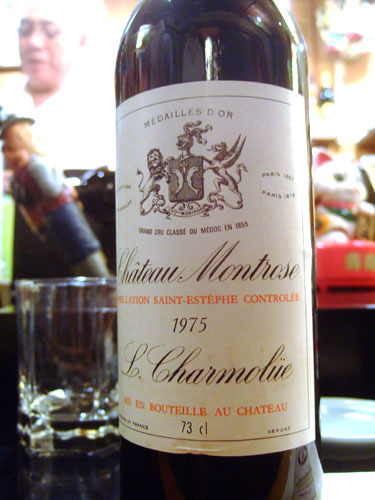 Unlike most of the wines here, the '75 Montrose tasted rather young, belying its considerable age. It was rather tight initially, but did open up later, showing bright notes of red fruit and cassis, with firm tannins. It was one of the standout wines for me (along with the Tondonia and Dom), and wasn't bad with the hamachi belly either. 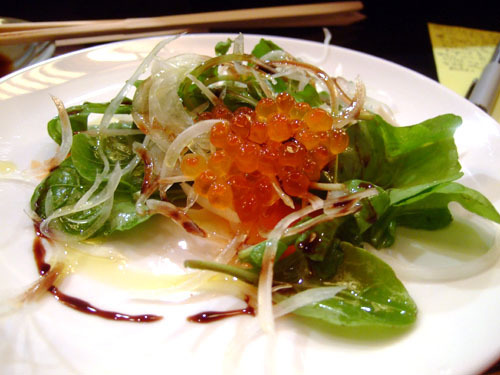 "Parent and child" in one dish is how Ryan described this salad of salmon and its roe. I liked the bitterness imparted by the arugula and onions, and how that played with the olive oil and balsamic. Again, as with the albacore salad, the fish, and even the briny roe, was almost like a supporting player in this production. 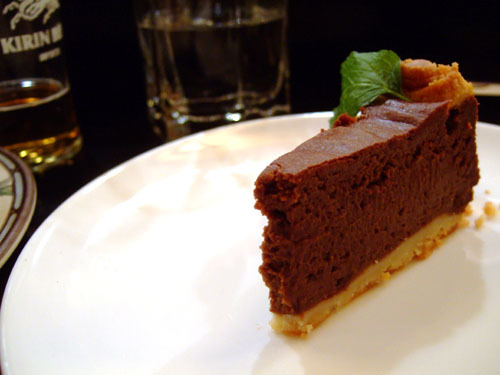 A refined bitterness was the main thrust of this dish, which formed a welcomed foil to the Bordeaux. 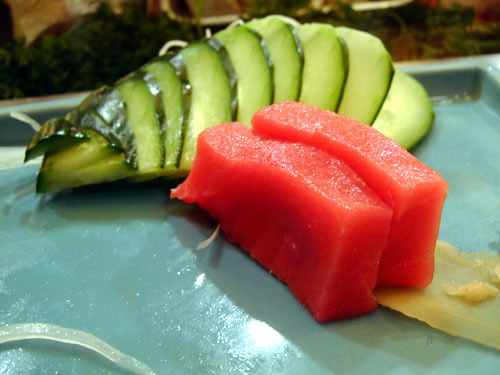 Compared to the sashimi preparation, the toro worked much much better in sushi form. I think the rice adds balance and a nice textural counterpoint, and the addition of wasabi really draws out the flavor of the fish. 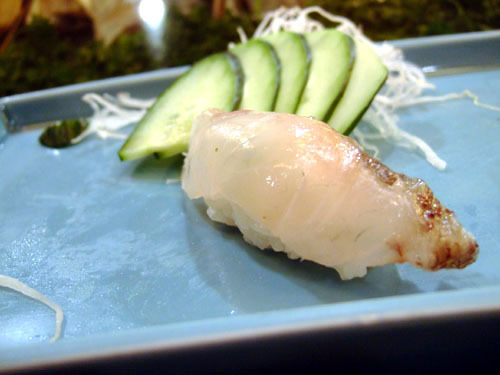 One thing I noted with Shige-san's nigiri was the use of warm rice, reminding me of Echigo and Sasabune. Will told me that this was hamachi belly, though I'd have a tough time distinguishing it from standard yellowtail. In any case, the fish had a crisp creaminess that was nicely balanced compared to other versions of hamachi I've had that were too heavy. It wasn't bad with the Beychevelle and Montrose, though the pairing wasn't as seamless as it was with the tuna. 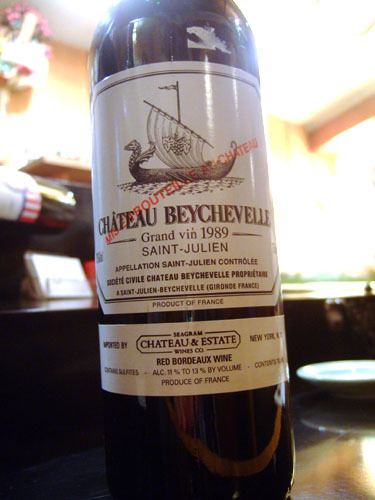 The last wine of the night was also the youngest: the 1989 Château Beychevelle. The wine's age was apparent upon tasting, where I noted much heavier notes of dark fruit and chocolate. In addition, the wine was chewier, more viscous, with stronger tannins to boot. I liked it, though a decade more in the bottle probably wouldn't do it harm, especially if paired with sushi. 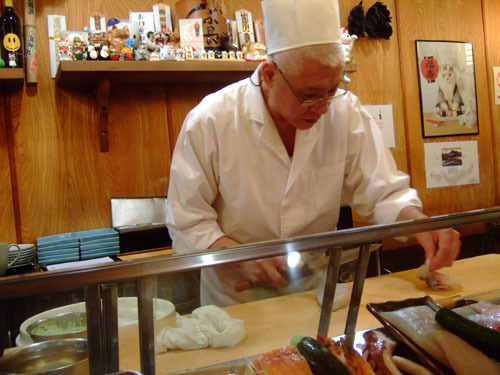 Here we see Shige-san cutting up pieces of red sea bream, my favorite sushi of the meal. The tai snapper came from Japan, and was served with yuzu and salt. The contrasting sour and salty flavors formed the perfect counterpart to the fish. I think this would've gone great with the Champagne, but it was long gone by this point! 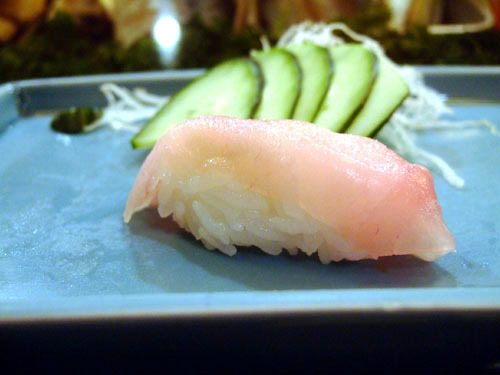 Kinmedai is also known as golden eye snapper, a fish that I'd only had once before, at Sushi Sasabune. It was similar to the tai, but the texture was creamy more than crisp, and it came without the tai's accoutrements. Quite nice. This was braised buri collar with daikon root. 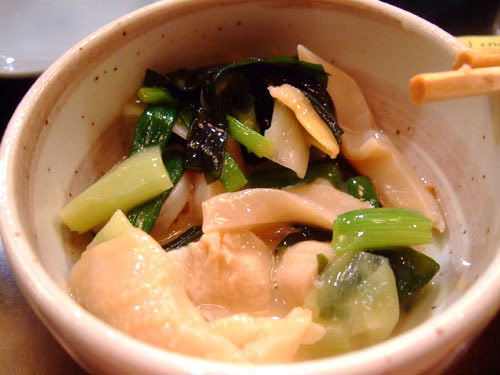 A more home-style dish, the main taste component here was ginger, and the fish really soaked up the flavor of the sweet, yet savory broth; and in fact, the daikon, which is typically very mild, was completely permeated as well. It was actually reminiscent of some Chinese-style stews I've had. The strong, rich flavor of the dish made it a prime candidate for red a wine pairing. 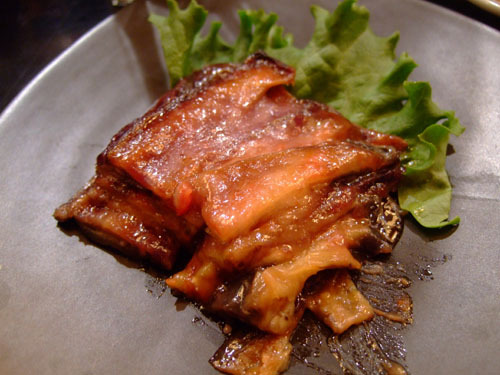 This was anago, or sea eel, served with eel sauce as well as sansho (or Sichuan) pepper; despite the name, sansho's actually not a pepper at all, but a fruit. Its tartness added another layer of complexity to the sweetness of the sweet soy-based sauce and made this one of the best versions of anago I've had. 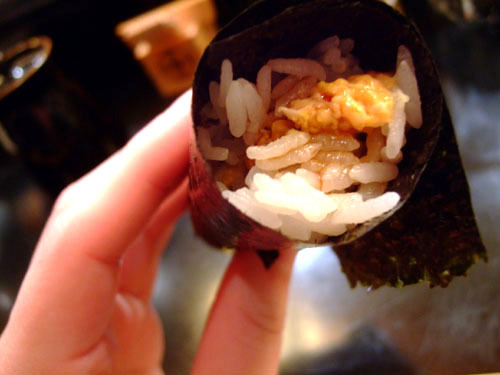 Simple but effective: uni and rice, wrapped in nori. The mild sweetness of the sea urchin was complemented perfectly by the rice, and the end result was marvelous, one of the highlights of the meal. 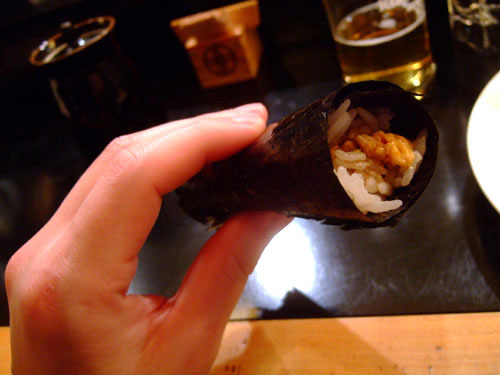 Think of it like Sasabune's signature blue crab hand roll, with uni instead. To cap off the meal, we were all given different desserts. 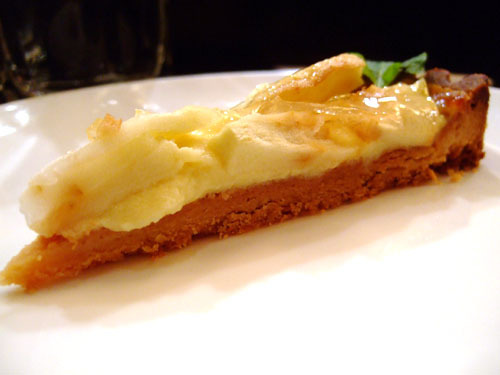 Rather than your typical Japanese desserts, Shige-san serves Western-style creations, including cheese cake and flan. I was given a slice of an apple tart, which had just a lovely crust. I also got to sample Ryan's tiramisu and Will's chocolate tart. Along with dessert, we actually had some sake as well. Interestingly, Shige-san revealed that he's not a fan of the drink, complaining of the additives present in much of the sake available in the US. I guess that's why he sticks to wine! 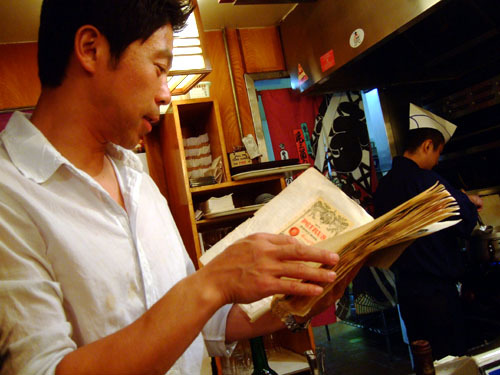 The reason FoodDigger chose to hold this event at Shibucho was that Shige-san is a serious connoisseur of wine fine, especially French varieties. 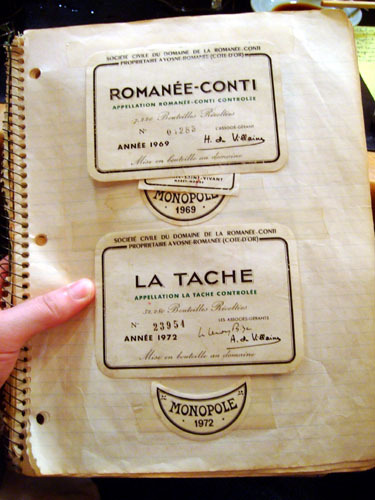 To see this, just ask to see Shige-san's worn, yellowed notebook of wine labels from his favorite bottles. DRC, Petrus, all the first growths--there were some mighty impressive labels in there! In fact, he even took the labels off the wine we drank tonight and gave them to us to take home. Shibucho has a pretty impressive wine list for a Japanese restaurant, and many of the selections are from Shige-san's personal collection. I understand that he's willing to let go of wines not on the list as well, for a price of course (I believe I heard a 1966 DRC Romanée-Conti for $15k!). 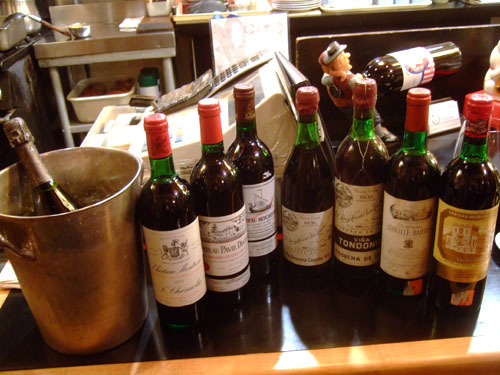 Shige-san buys many of his wines at auction, and he told us of a story once where he was able to purchase a case of 1969 Lafite at auction for a ridiculously low price, and subsequently used the Lafite as cooking wine for some filet mignon! A photo with Shige Kudo (right). So...red wine and sushi? It was an interesting experiment to say the least. But I'm glad to report that yes, it can work, though definitely not all the time. I don't know if there was a consistent theme that emerged, but in general, I'd say that the more delicate fishes (e.g. whitefish) didn't take as well to red wine. I'd also try to avoid the fruit bombs, as they'd just wipe out any semblance of flavor from the sushi, as well as anything too tannic. I was kicking myself for not bringing a Pinot, like the Kistler we had at Totoraku, for comparison. Oh well, there's always next time. Some have complained that Shige-san has a bit of "sushi nazi" persona, though I found that to be completely not the case. Throughout the night, he was extremely amicable, friendly, and even funny at times. I think part of the issue is that he doesn't like to do omakase for just anybody, but only for regular customers with whom he has a trusted relationship. But what struck me even more about Shibucho was how long the place has been around. No other sushi place I've been to has that kind of history attached to it. I mean, the place was launched in the dark ages of the 1970's, a time when most Americans were probably unaware of sushi. I wonder what it was like back then. 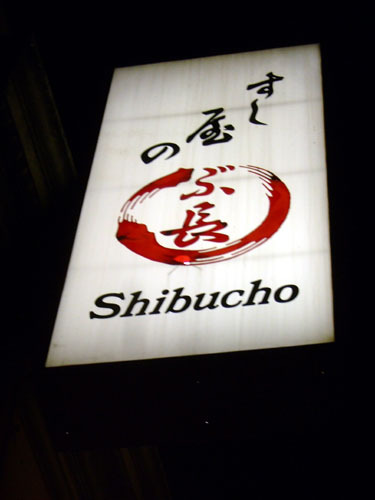 Was Shibucho traditional like it is now, or did they have to cater to an inexperienced American palate? 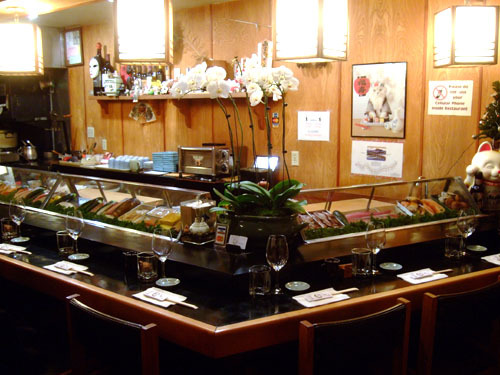 The infamous California Roll had been invented by then, so was it ever a fixture at the restuarant? It would be fascinating to discuss such things with Shige-san, someone who's been at the forefront through it all, from an era when sushi was a novelty, to now, when it seems likes there's a sushi bar on every street corner. But alas, that is a conversation best saved for another meal. Although we have not been recently, my husband and I have been going to Shibucho since we first met 11 years ago. This entry makes me remember why. Glad you have discovered one of my favorite holes in the wall. 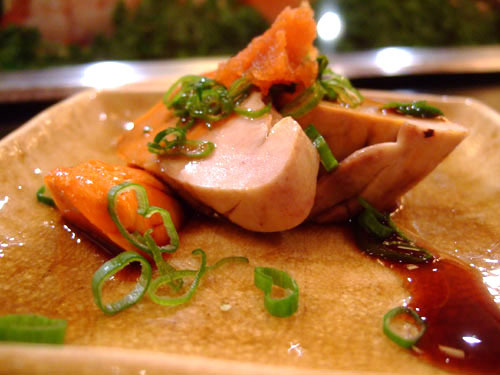 the more he get to konw your taste, the more "regional japanese seasonal dish" you will get to taste. 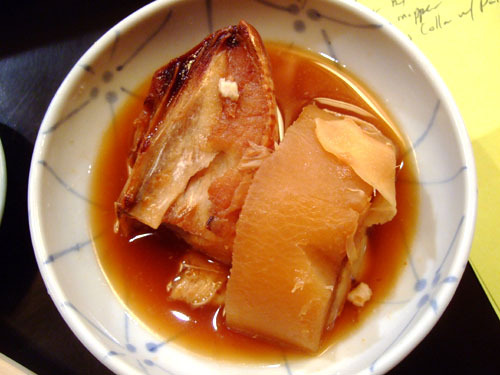 Dish 14 Buri-Daikon (ブリダイコソ / ぶり大根) is a great example., which is a dish serve during winter and new year time Japan. The dish orgin from Toyama prefecture can be chase back as early as Edo(1603). The fish most likely come from that area and one of the price Kanburi -- same fish but price and name change at the same time (ワタラキ,ガソド,ブリ) Hanburi are caugh in winter time before the fish laid their eggs. Maryann: Thanks! But what do you mean by "send one of these beautiful dishes over to us?" I don't follow. Food, she thought. : It's great to have a place where you can grow and develop and form a history. 11 years! It's hard for me even to imagine going to a restaurant regularly for so long. Foodie Traveler: I totally agree that Burgundy would probably work better than Bordeaux, though I guess the point of the dinner was to think a bit outside the box. Maybe next time we'll bring out the Burgundy, Barbaresco, maybe even some Aussie Shiraz?!? ilikejane: Wow, small world eh? Are you talking about Naga? I thought he was still working at Shibucho. What's he up to in Hawaii? dhkm: Thanks for the background on the dish! I appreciate seasonal dishes such as this, as they're a refreshing break from the norm and really allow the chef to apply more of his distinctive touches to the food. I don't know if it's just me, but some of the rice in the pictures looks longer-grained than most Japanese rice. Did you find out anything about his rice? Did it feel any different? Very observant of you. The grains do look a big longer. Nobody mentioned anything about the rice specifically, though it was perhaps a tad less "sticky" than normal. Have u ever try Oshi-sushi (Osaka style sushi), Temari-sushi (Ball shape bite size sushi) , Nare-sushi (old style fermented sushi), or even Kakinoha-sushi (Trandition Nara prefecture sushi) if not u should fine a restaurant and try, it gonna be different than most sushi u ever have. 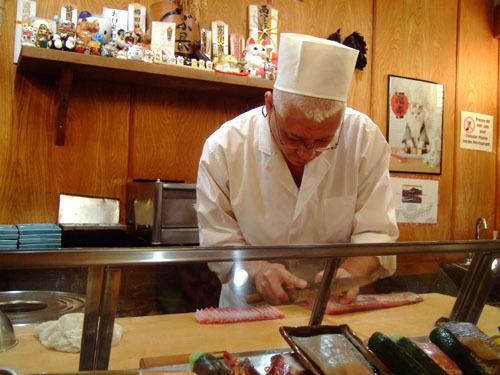 if u can u should also write about the different sushi making style each chef have. (4 version of full hand press and 2 version of finger press -- training background), also the press count of making each piece (skill). there might be a error on your post buu i could not say for sure, caz it is often mislable. 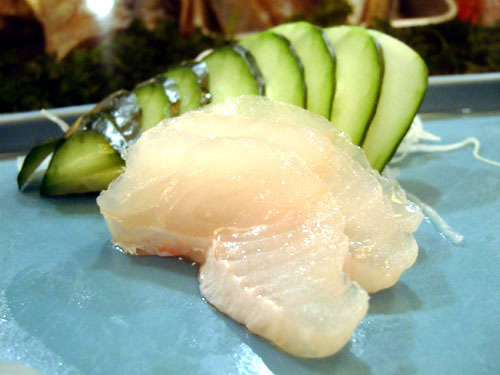 In Japan, Himare mean fluke (summer/winter flounder) which best serve winter time, Ohyo mean pacific halibut which serve year round, Karasu Garei refer to atlantic halibut even it means "cow flounder"
question reguarding rice, there two kind of rice favor by japanese. Akita Kamachi (medium grain) and Koshihikari (short grain). Both are wildly use in sushi restaurant (type use base on the prefecture). 90 % of chef use komai (old crop) rather than shinmai(new crop). While shinmai use as is,komai alway blend (each restaurant different) which will caz the taste and testure different even if it cook by same person. dkhm, I've heard of all those other types of sushi, but have never seen a place that serves them here. They do seem very interesting though. As for the sushi making style, I don't know about all the different techniques involved, but will try to make note of it next time. On my last two Urasawa reviews, I have video of Hiro-san making sushi. Check those out and see if you have any comments. As for the halibut, people usually refer to it here at hirame, but you're right that it may not be the most correct name. 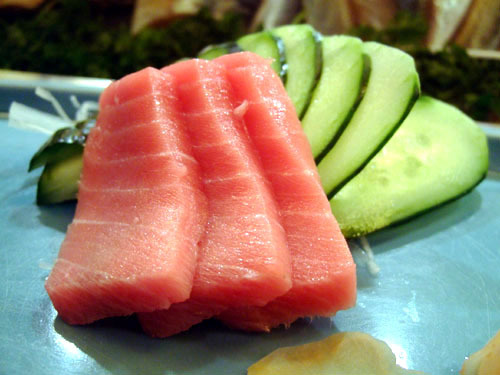 There is often times a lot of confusion and mislabeling here when it comes to the various types of sushi fish. Also, thanks for the clarification of the rice. Shinmai is stickier if I recall correctly. 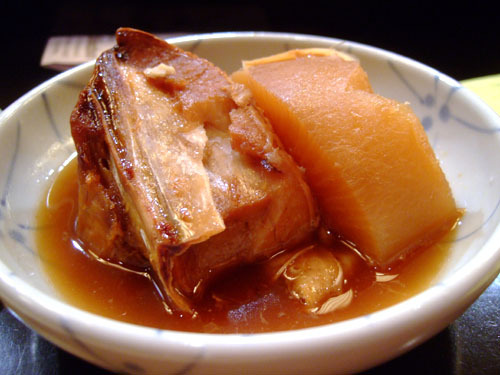 that stewed dish is called 'buri-daikon'. simple. it's basically one of those nostalgic grandma's dish kinda thing. i was surprised to see it at a sushi bar! i'm hoping "tokyo town" in LA area will sell those on March 3, the day of Hinamatsuri. On other hand, i also hope there are kyoto style restaurant will have it on the meun. I just think it will be a fun post to read since all ingredients for temari sushi are ether simmered or cured. ila: Thanks. 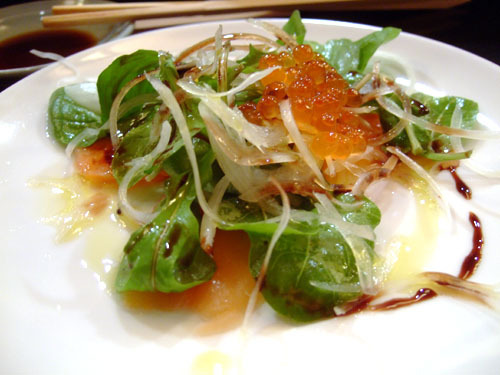 I've updated my post with the buri daikon. Maybe you can make some temari sushi next Hinamatsuri? ;) I'll be gentle. dkhm: Those temari sushi almost look like candy. We'll have to see if they're available here next Girls' Day. I had the 05 Montrose a few weeks ago and I think what I say holds true to most of their bottling ... they age and they age well. Not surprised the 76 is still showing young! Shows you that Parker bordeaux Vintage Charts don't know everything =). It was great having you on yet another food adventure. Although not all of the fish paired well with the wine, the ensuing conversation was worth the time and effort. 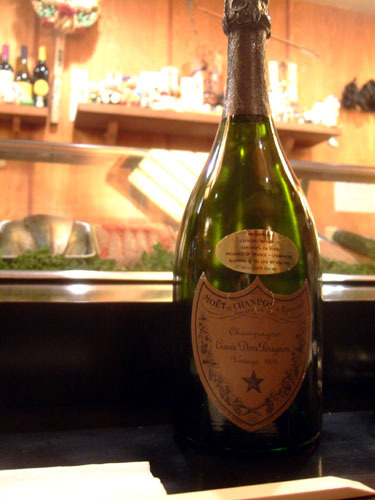 Thanks again for bringing that delicious Dom. I can still remember the aromas! In Shige-San's defense, he served up the best toro I've ever had the week before. He couldn't promise the same quality, due to availablity. Not top drawer, but still very high quality. And the hamachi belly? Yum! Slightly fattier, flavorful and more tender then the loin. Gorgeous! Thanks again for coming. Have fun in NYC! Charlie Fu: Totally agree about the Montrose. The experience really got me interested in pairing other red wines with sushi. You mentioned Pinot on one of the Urasawa posts. That would probably be the best choice, but I'd like to perhaps do a meal sometime with that, an Aussie Shiraz, some Rhone, Malbec, Zweigelt, etc. It was chutoro. Shige-san prefers bluefin from Canadian waters, but he couldn't get it for that evening. I think he would have preferred not to serve the Italian toro, but we asked him to try his best to have some for that evening's pairing. I'll catch you guys on the next trip. Don't hurt yourself with all of those stars! I don't think any food goes with Aussie Shiraz =) Except Chinese food.. but Chinese food goes with everything! I didn't know you went to that event last Wednesday. I was thinking of RSVP'ing when Marshall sent me the invite. Darnit, I got to work late that night. I was hoping to meet you and Fiona. Next time for sure. The picture looks great. I'll definitely have to join you guys next time when I get a chance! Will: No worries about the toro; it was still better than a lot of other places'. Our next trip will probably be either Chicago (Trotter, Alinea, Moto) or Washington DC (Minibar, Citronelle, Little Washington). We'll let you know. Charlie Fu: Ouch! You bring up an interesting point about Chinese though. I've never dared to pair it with any wine before. Pepsi Monster: That's too bad. Definitely come out next time. It'd be great to meet you too! Chinese is so versatile that you can really eat it with any wine. I know that Robert Parker and his "old" crew love to drink wine and eat chinese food. Charlie, I remember you mentioning before that you do wine and Chinese dinners somewhat regularly. Perhaps I need to join you on one of these. We have a Shanghai-nese pairing with Spanish reds in the works. We've done a number of private staff dinners pairing Chinese with wines. In fact, we almost did that as opposed to Shibucho. But that pairing was too intriguing to pass up. Charlie's right...great pairings for wine and Chinese. Parker loves dim sum with Barbaresco, too. No worries...we're on our game! kevin, chef table at Citronelle a must, ~$3200 min. for 8 in year 2000 (2 in my case as u may recall) , it'll make u feel like u're in Paris. I find out later through B-School Club,Chef Michel Michard are few chef have the honor to cook for French Amberssador Poletti and Vimont, he also help out during major privte event host at emberssy. Will: Glad to see you're on the ball with this! dhkm: I went Citronelle years ago (had the Promenade Gourmande menu) and was quite impressed--easily the top restaurant in DC in my opinion. Unfortunately I won't have any time to check out any other restaurants in NY though, as I only have four days. Japanese with a Swedish-Ethiopian twist does sound very interesting however! Another must in DC/anywhere is able to attend event cook by Chef Walter Sheib, who is he u may asked. He been the exe. chef for The White House for 11 years (1994 - 2005). As for Chinese, for some reason I like to pair it with ICE WINE. I find it interesting that Sheib was let go suddenly by Laura Bush after serving for 11 years. From reading his web site, unfortunately it looks like he doesn't cook regularly anymore. As for the ice wine, I love it for dessert, but I can't really imagine it with Chinese. If the FoodDigger dinner happens, I may to bring a bottle to try it out. first try it with chinese made ice wine, I believe the name of it is Yasay, i come across it once when i was in canada. It taste different than most ice wine since it taste more like pop. my ice wine pairing choice for chinese are Ochs Gewuerztraminer Beerenauslese. Interesting. I never knew the Chinese made any quality ice wine (or quality wine for that matter).